Xander Bogaerts probably thought he was home clear. 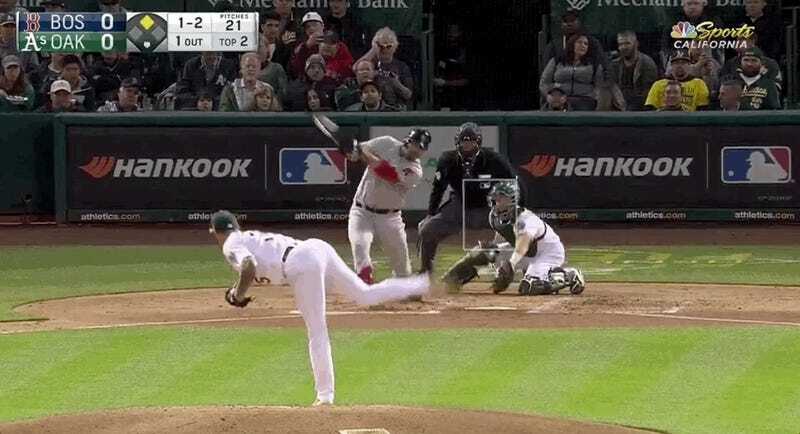 In the second inning of last night’s game against the A’s in Oakland, the Red Sox shortstop took off from second after Mitch Moreland lofted a single into center field. Unfortunately for Bogaerts, he chose to run on Ramon Laureano, who has a goddamn cannon for an arm. Laureano zipped it at 96 MPH to the plate 270 feet away and caught Bogaerts at the last possible second. Umpires reviewed the play, and though it seemed like Bogaerts’s foot got to the plate before Laureano’s throw, they ultimately ruled that he lifted it up when the tag was applied. The Red Sox only managed two more hits all night, while the A’s ran away with a 7-0 blowout win thanks to four dingers. Fittingly, Laureano smacked the longest of the bunch at 428 feet. SB Nation A&apos;s Blogger Let Go After Tweeting About Wanting Kyler Murray To Get "Critically Injured"